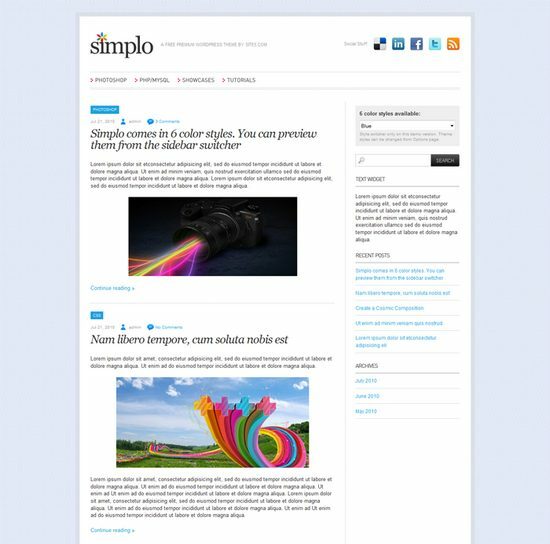 Today we bring you free premium wordpress themes for your new blog on WordPress. Wordpress is a simple blogging platform and it’s the no.1 blogging platform now that was using by many big magazine as: CCN, Mashable, Digital Photography School, TechCrunch and more… When starting a magazine website, the first step is find a good design for your site. So we’re sharing with you 30 of the best free premium magazine wordpress themes to help you to choose a nice theme for your new magazine website. 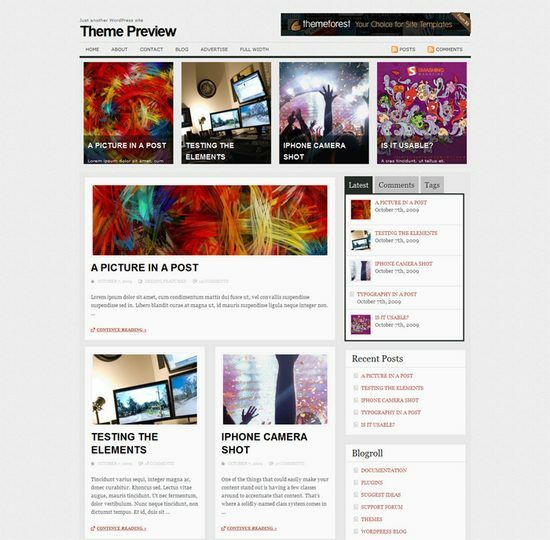 Hopefully you will enjoy this collection and it can help you find a good theme for your project. 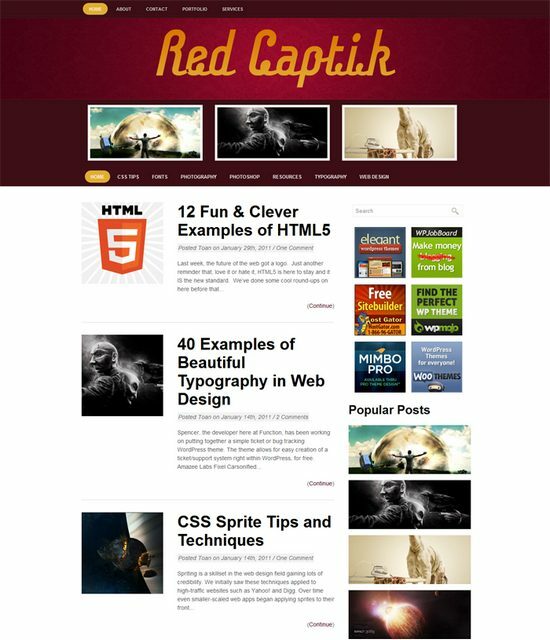 Red Captik is a free Premium WordPress Theme comes packed with a custom featured content. Suitable for magazine and blogging websites. Theme options at admin panel with advertisement & google analytics ready. Dimenzion is a mini magazine theme, created with dimensional view in mind and combination of yellow tangerine, brown, light teal as color scheme. 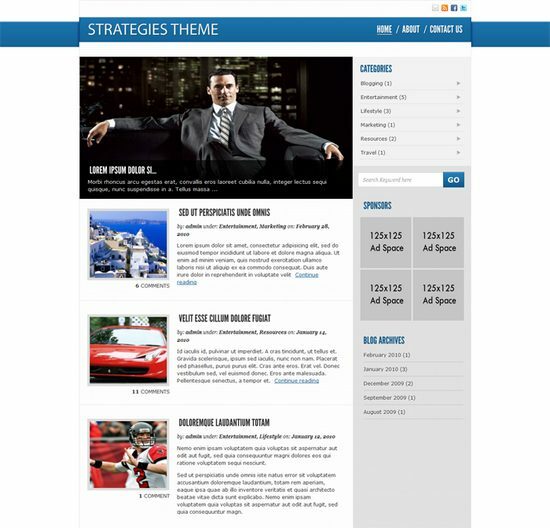 Strategies Theme is a simple yet elegant Magazine Style Design Theme. It has a management console, is widget ready, advertisement ready and is an easily customizable theme to use. 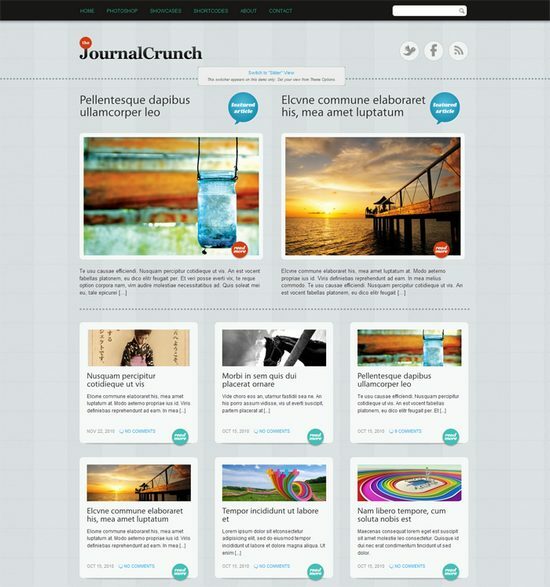 The featured image area on the homepage is run off the JQuery image rotator. 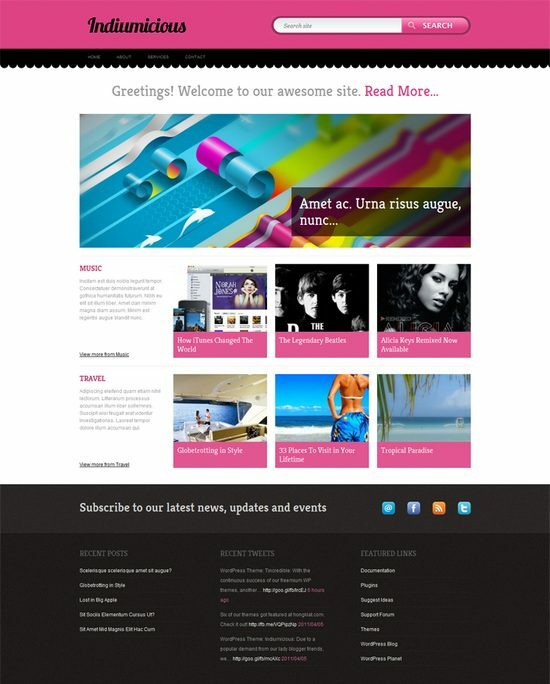 Works in IE7, IE8, Firefox, Safari, Chrome, Opera and is compliant with the latest version of WordPress 3.0 and above. 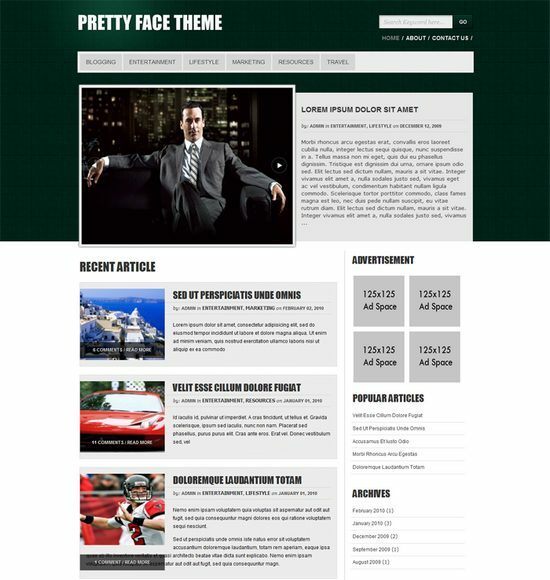 Pretty Face Theme is a simple yet elegant Magazine Style Design Theme. 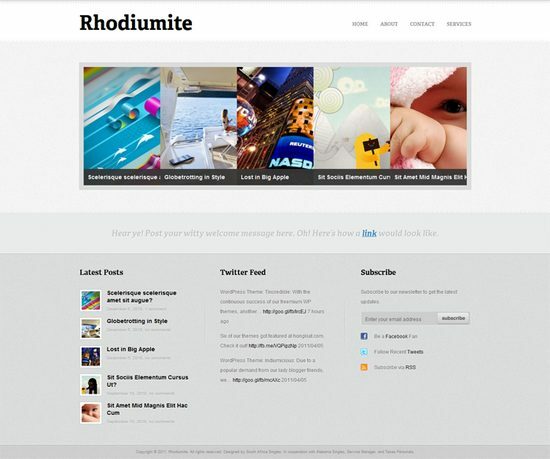 It has a management console, is widget ready, advertisement ready and is an easily customizable theme to use. 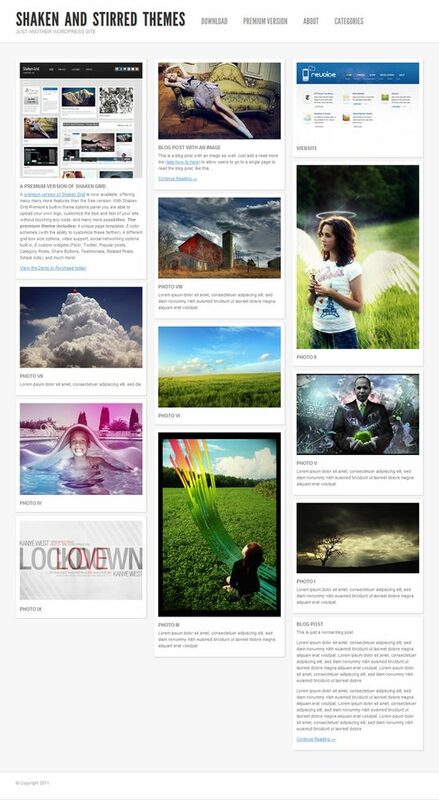 The featured image area on the homepage is run off the JQuery image rotator. Works in IE7, IE8, Firefox, Safari, Chrome, Opera and is compliant with the latest version of WordPress 3.0 and above. 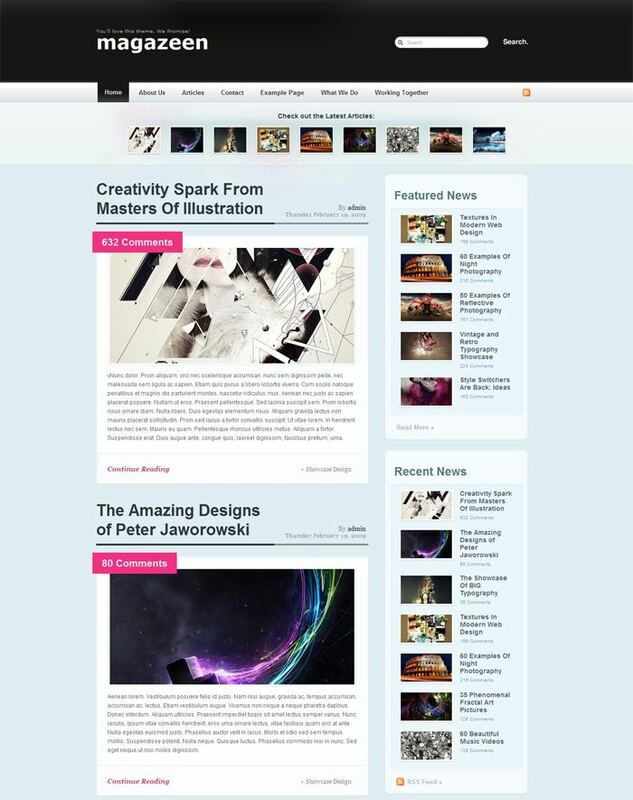 Magazeen — a free advanced WordPress-theme in a magazine-llok created by the talented WeFunction Design Agency. This bold magazine 2-col-theme was designed with the main focus being on typography, grids and magazine-look. It was created especially for Smashing Magazine and its readers. 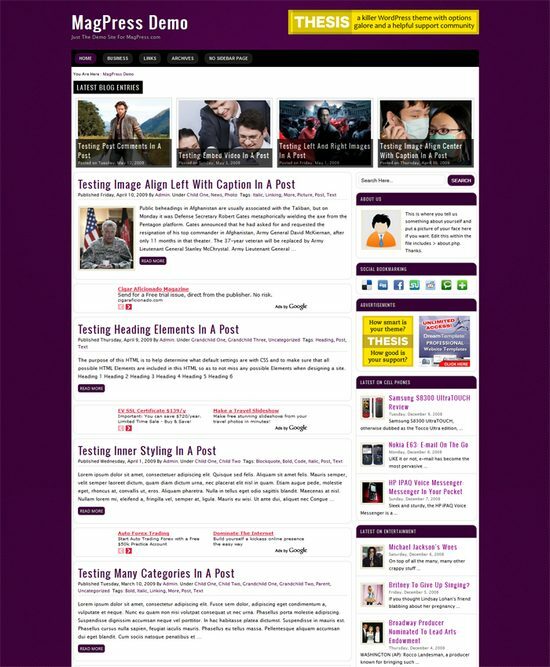 Purplex is a 2 columns fixed width WordPress theme by MagPress.com. 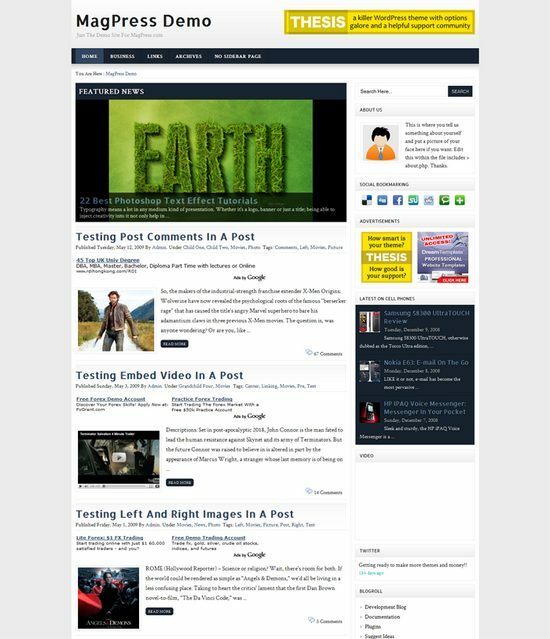 This WordPress template comes with theme options, featured categories, customized latest posts display, footer widgets, Adsense ready and many more. 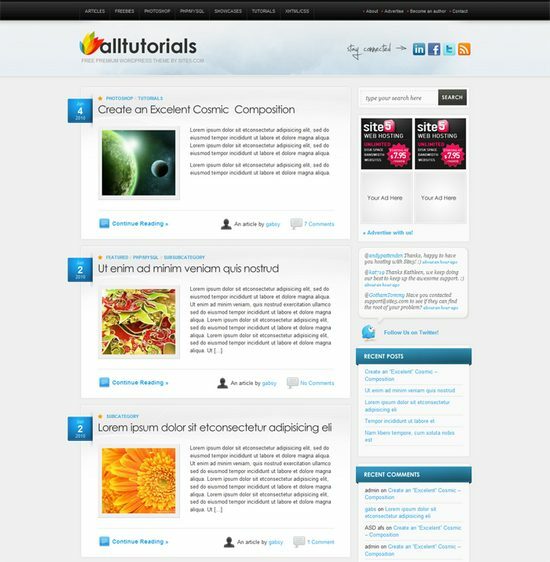 Indiumicious has a unique custom front page and fancy jQuery slider with 7 transitions to choose from. 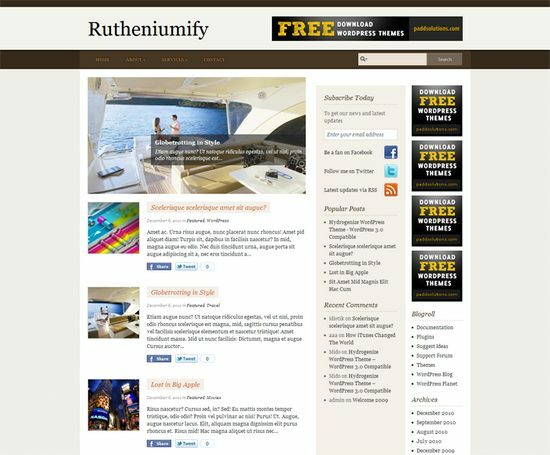 You can publish three recent posts from your two important categories to showcase in the home page section. It also has a section where you can post a welcome message to your readers. 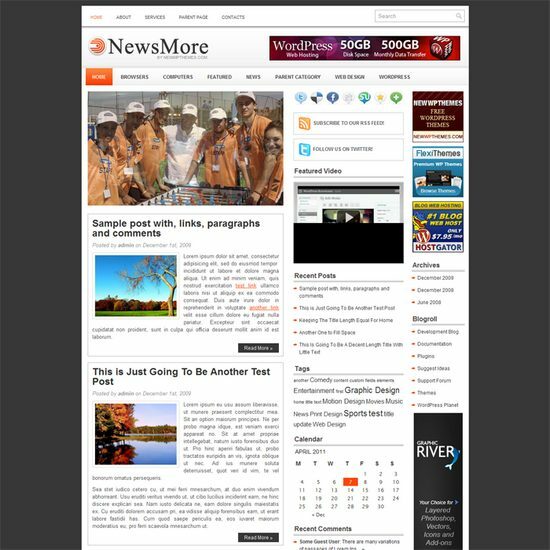 Thus, installing Indiumicious WP theme will transform your basic WordPress blog into a fully functional website with CMS features. Tincredible has an enhanced fancy seven (7) slider options which highlight your important posts and crafted with a custom typography. Another important feature we added into this theme is the easy customization of the Site’s title. You can just choose whether to upload an image or just plain text title. 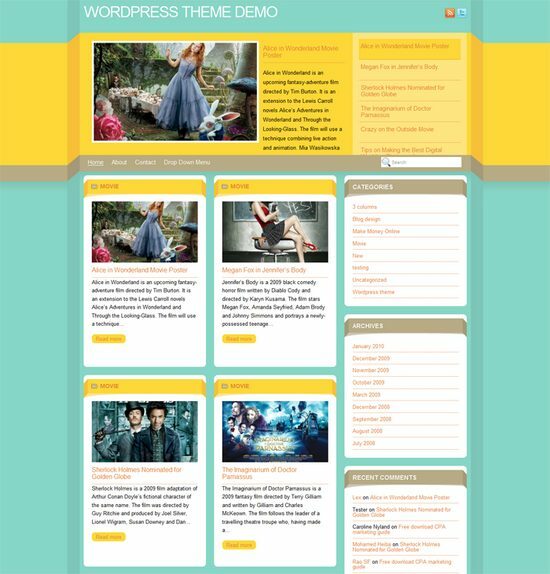 Socrino is a 2 columns fixed width WordPress theme by MagPress.com. 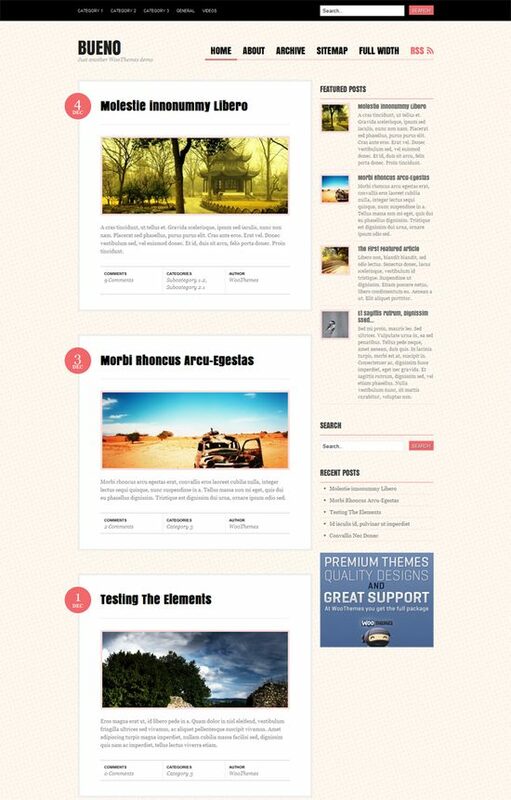 This WordPress template comes with theme options, featured content slider, featured categories, Adsense ready and many more. 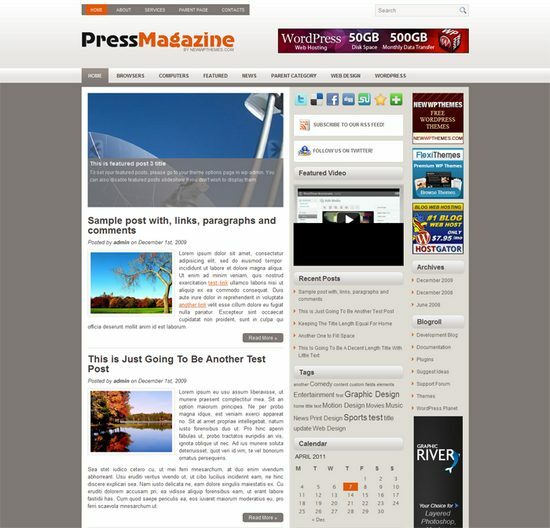 PressMagazine is a free premium WordPress theme with featured content option and options page. Supports post thumbnails. Suitable for any niche, especially for news or magazine sites. 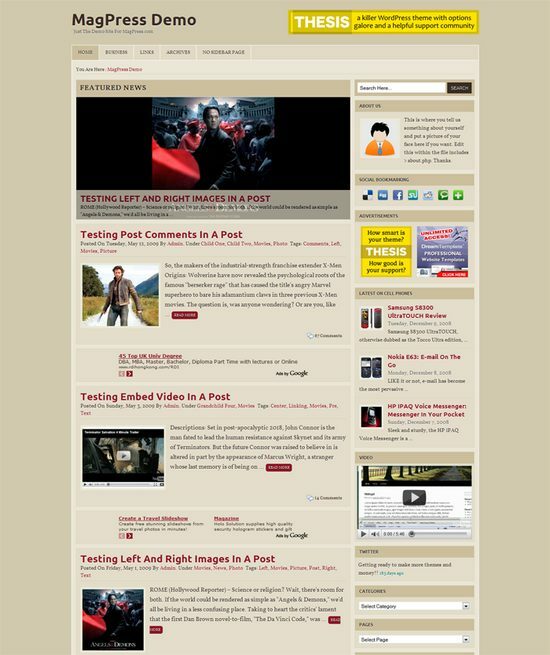 Adena is a 2 columns fixed width WordPress theme by MagPress.com. 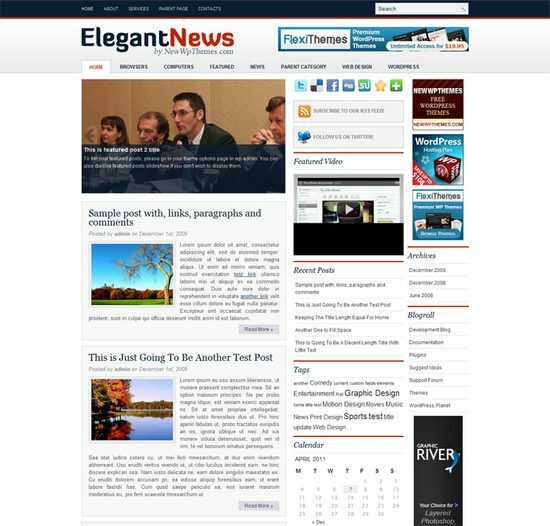 This Magazine style WordPress theme comes with theme options, featured categories, Adsense ready and many more. 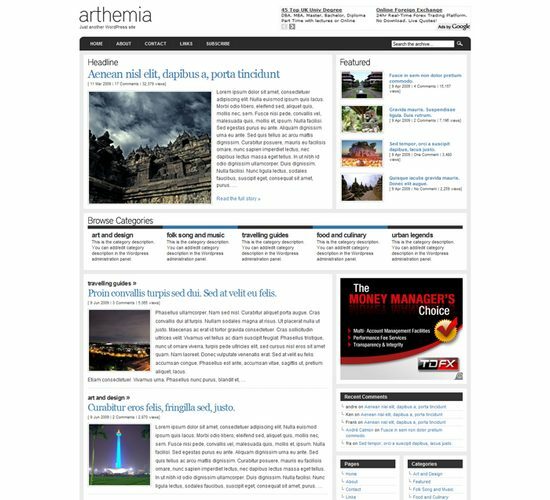 Arthemia is combining a magazine and a weblog into one; it is not too magazine-ish nor too blog-ish. 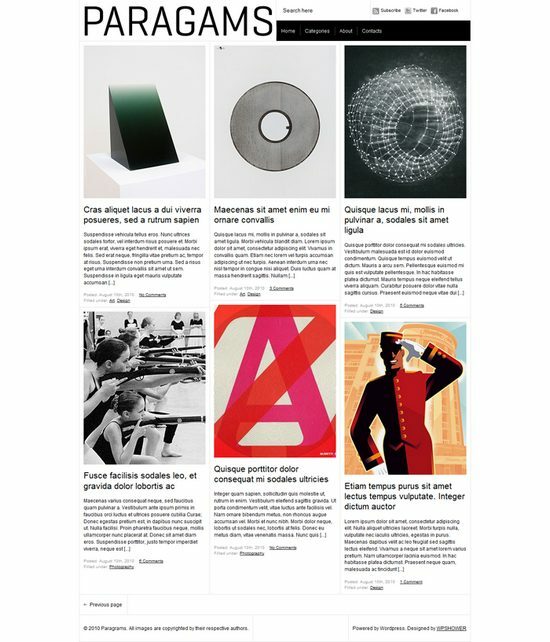 The front page of Arthemia shows the headline and featured post of yours along with the pictorial representation, that’s the magazine style, while the rest of your post will be shows sequentially just like a usual weblog. 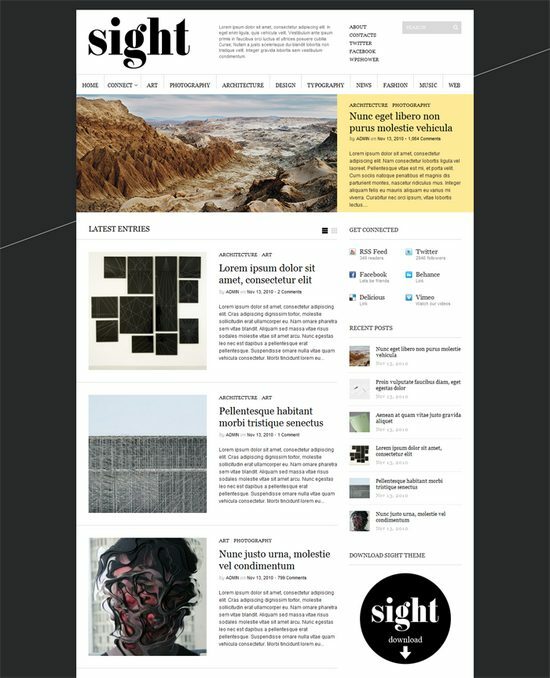 Sight is a powerful WordPress theme, best suited for Magazines and Blogs. The theme was designed in modern minimalistic style with Golden Grid usage. It has two views to get information in the way you want – standard blog view & grid view. A big image slider on the top gives you extra ability to show the most important content. 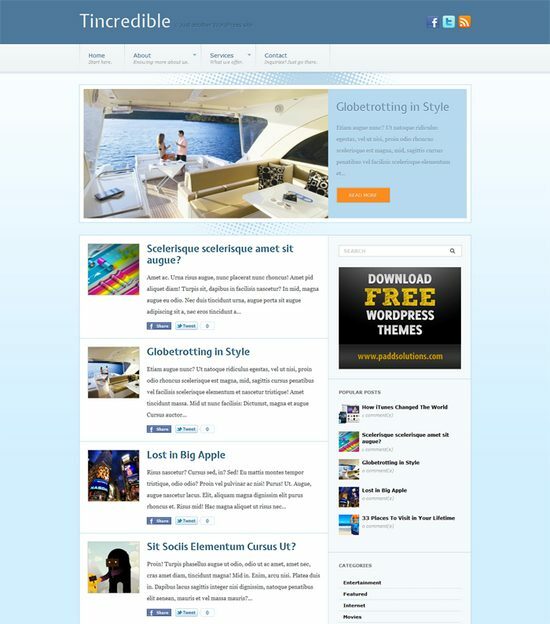 The theme supports the newest WordPress versions and has 2 Custom Menu Locations. 2 pagination types are available: Default with WP-NAVI support and Ajax-fetching, like in previous Twitter interface. 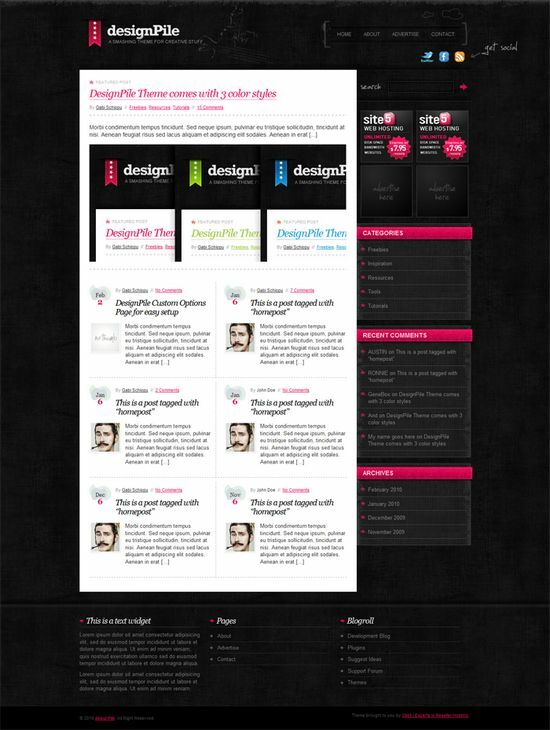 The Sight theme supports Social Media. It has links to share each post to Twitter, Facebook, Delicious Digg, no plugins needed. It is also Search Engine Optimized, so you don’t need t o care about, just setup and get love from Google. 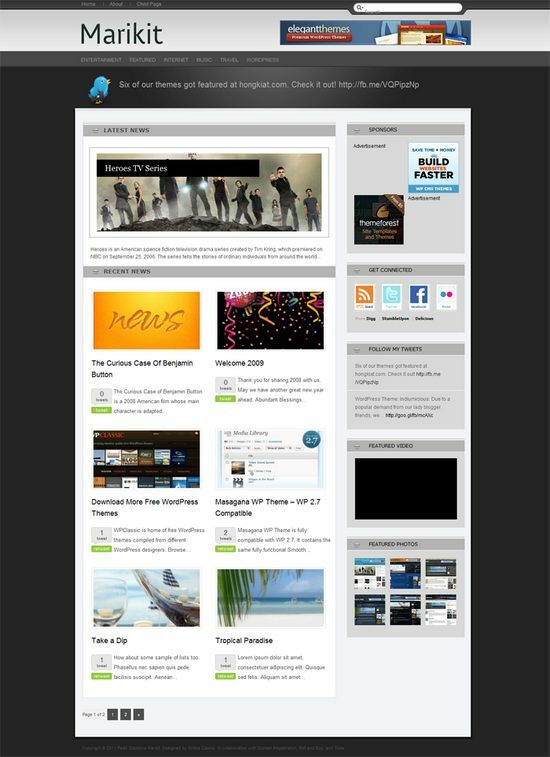 Paragams is free premium wordpress theme made using grid design techniques. It is very lightweight, almost no images are used. It include a lot of custom features and is easy to use. 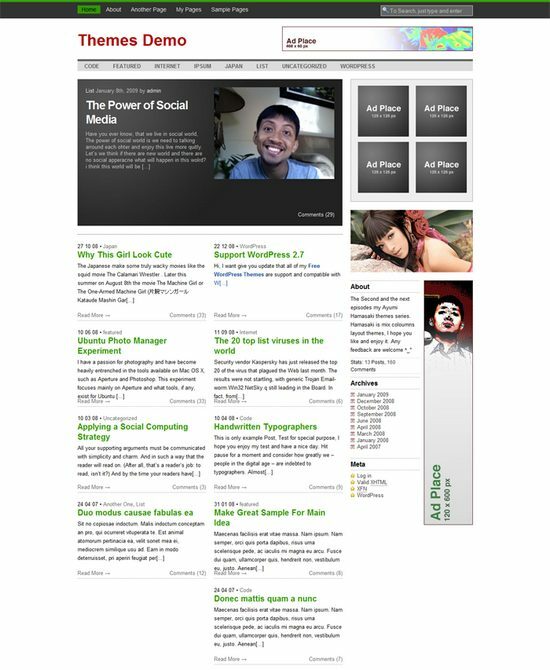 It’s perfect for almost everyone who want to write articles, news, or publish an online magazine. We also made a very cool drop-down menu and implemented some ajax stuff here and there. 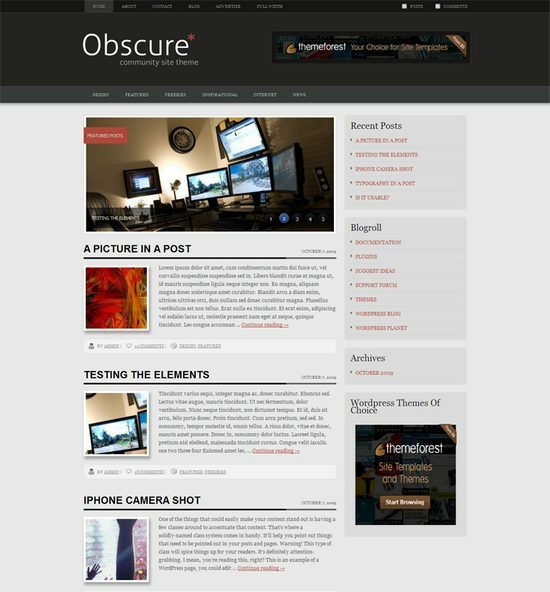 Obscure is a premium dark magazine wordpress theme suitable for any site nitche and best fit for community based site.